What does Donald Trump know right now that we don’t? 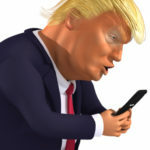 Something appeared to leave Trump shaken on Friday, to the point that he spent the entire evening posting one agitated and increasingly bonkers tweet after another. By the end of it, Trump had cut a jarring swath even by his standards, and it was difficult to figure out what was even going on. It all started on Friday night when Trump confirmed media reports that he considered flooding sanctuary cities with undocumented immigrants in order to punish them. So much for Trump’s premise that undocumented immigrants need to be kept out of the United States, period. Then things got weirder. Trump tweeted a story which falsely claimed that the Ninth Circuit Court had ruled in his favor on immigration. Then he began accusing Politico of being fake news. Then he accused NBC News of publishing a fake news story that didn’t even come from NBC News. If you’re confused, don’t worry, so was he. At one point Donald Trump went on a tirade about security and managed to misspell “security” in the process. Hours later, he still hadn’t fixed it. At another point he made the surreal false claim that “so many people” are leaving New York. None of it made any amount of sense, of course. Trump was simply foaming at the mouth in all directions, seemingly out of frustration and apprehension at whatever he thinks is about to happen to him next. What does he know that we don’t?